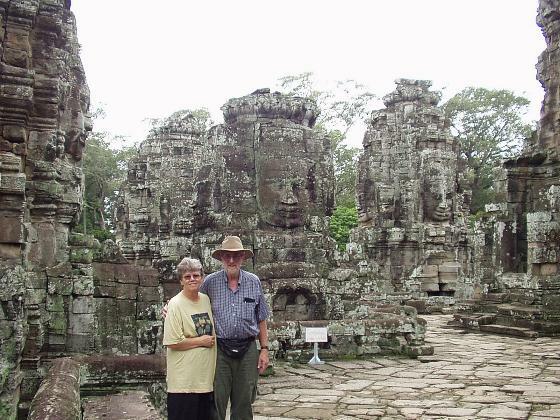 After considering different options we decide to go to Cambodia on a 3-day tour. 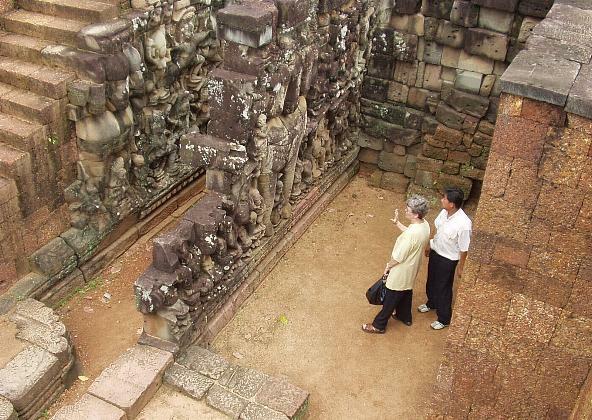 This would be the Siem Reap "Classic" package from "Pink Rose Holidays," which is an affiliate of Bangkok Airways. This would relieve us from the worry of making all the arrangements and would provide flight, hotel, meals, guide, and local transportation with driver. 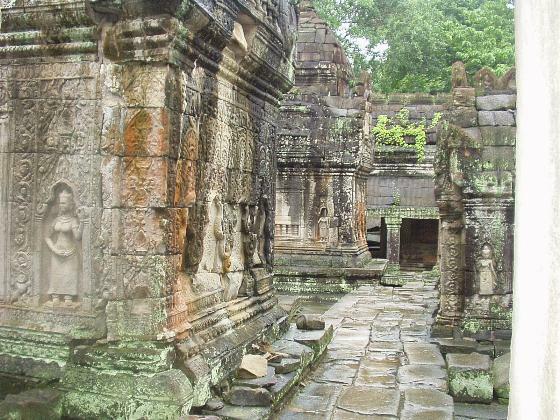 Our focus would be to visit and learn about some of the many Angkor temples and archeological sites near the northern Cambodian city of Siem Reap. According to the "Pink Rose" brochure, the temples here rank "among the greatest religious monuments in the world." 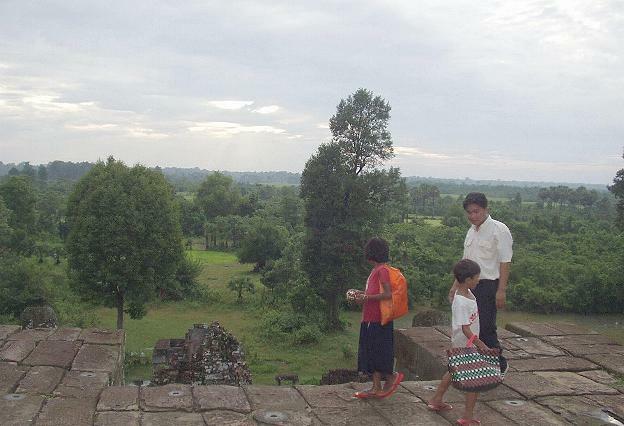 We would like to correct the often mistaken notion that the only site to see in Cambodia is the famous Angkor Wat. 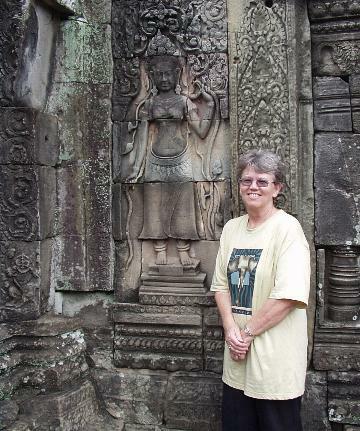 We were told that many tourists fly in to Cambodia, spend a few hours at Angkor Wat, buy the requisite tee-shirt, and fly out. 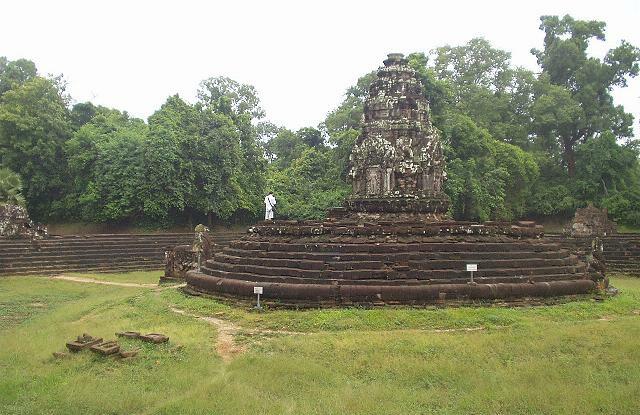 However, the Angkor area covers 77 square miles and includes dozens of temples and important historical sites. In our 3 days, we visited about 17 such sites and felt like we had just started to scratch the surface of this place rich with ancient culture. 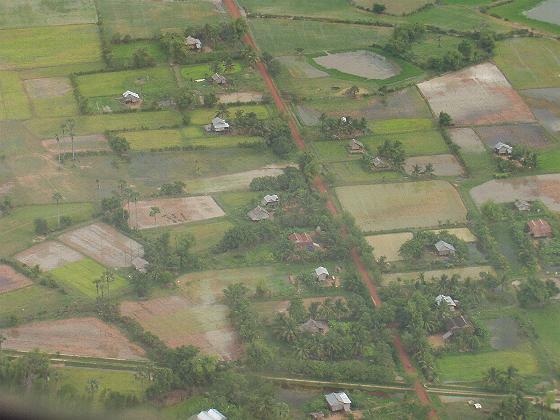 In less than 55 minutes out from Bangkok in our Bangkok Airways turbojet, we are looking down on rural Cambodia & preparing to land. This quick early morning flight would give us a full day to start seeing some of this area. We chose a lower priced option to stay in the Angkor Saphir Hotel. 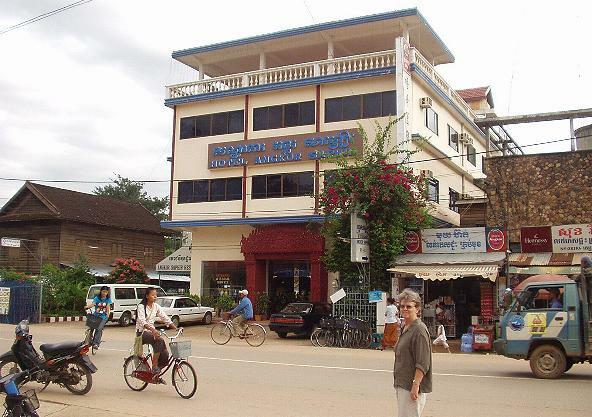 We are glad we did, because we not only saved a few baht, but we believe the placement of this hotel let us experience more of Siem Reap city life. 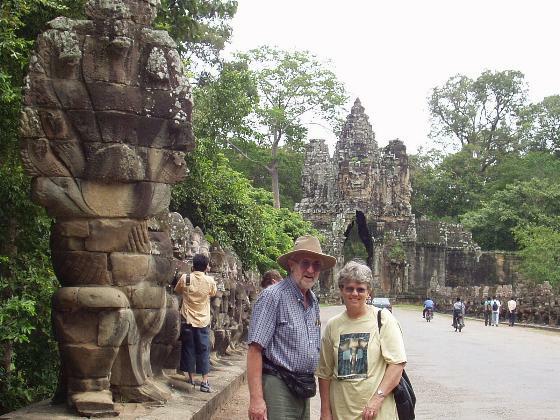 After checking in at our hotel, our guide & driver had us soon heading north out of the city, past the most famous Angkor Wat to here at the south gate of Angkor Thom - the "Great City" & 12-13th century capital. Through the gate & in the center of the ancient city, we spent time in the fascinating Bayon temple built around 100 years after Angkor Wat. 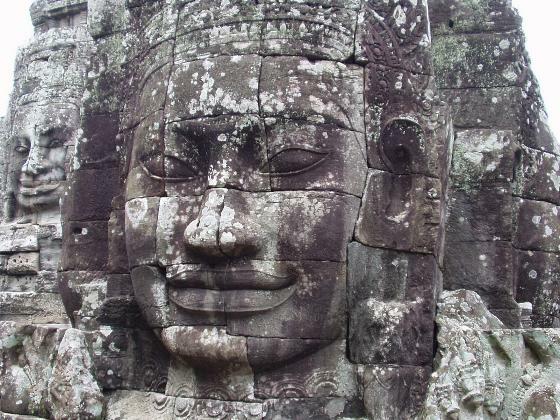 We found one of the most memorable features of this wat was the multitude of huge smiling faces. These 4 faces, facing the cardinal directions, are believed by some to represent the Buddha, while many experts maintain the are images of the King. 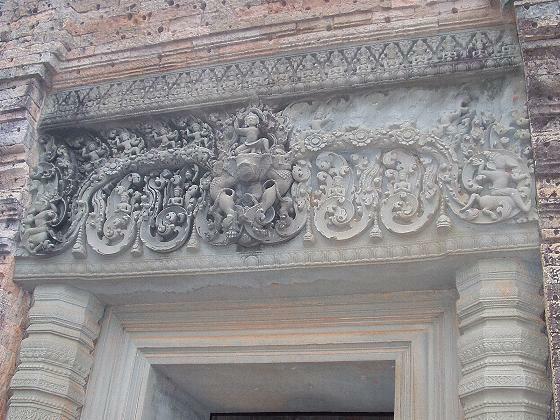 Sopheak told us the 4 faces represent: Compassion, Sympathy, Charity & Equanimity. 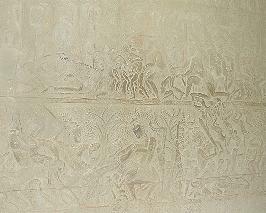 Also prominent are galleries of bas-reliefs depicting everyday life, as well as religious & mythical scenes. 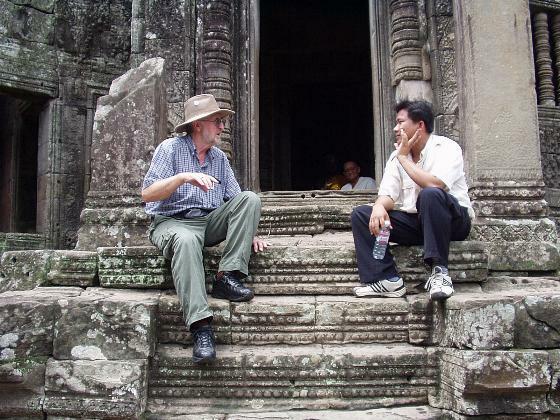 Keith takes a break from exploring Bayon & gets more acquainted with our friendly & knowledgeable guide, Sopheak. Peg poses by another lovely lady - an apsara, or divine heavenly being - also called a "celestial nymph." 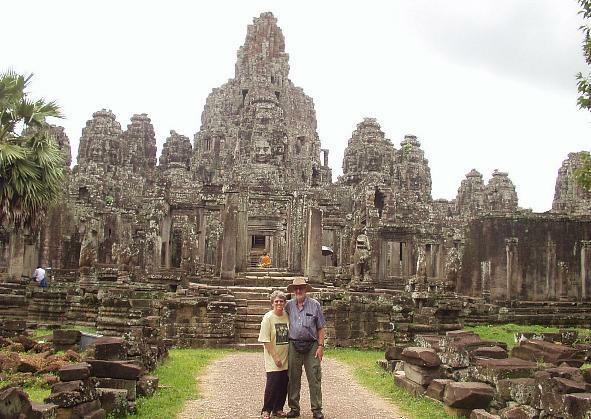 Sopheak takes this picture of us as we leave Bayon. 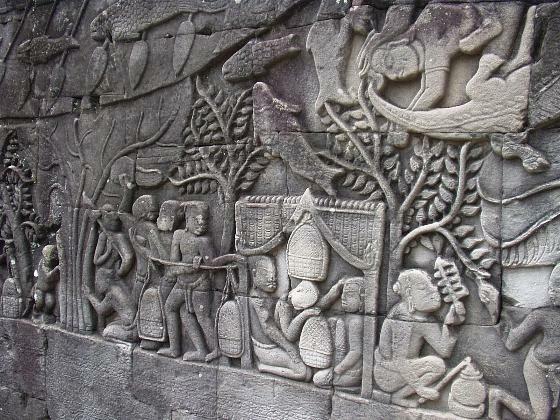 Next stop was the "Terrace of the Elephants" & "Terrace of the Leper King," both located on the Royal Plaza of Angkor Thom. Peg learns more about the beautiful bas-reliefs here from Sopheak whose knowledge of ancient art is extensive. After a fine lunch break back in the city we have to find shelter from a downpour. 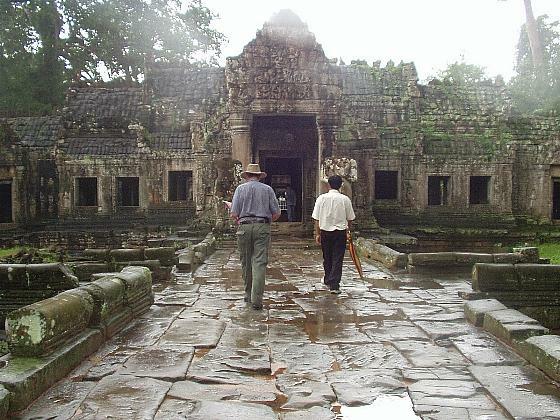 The rain stops and here we enter Preah Khan. 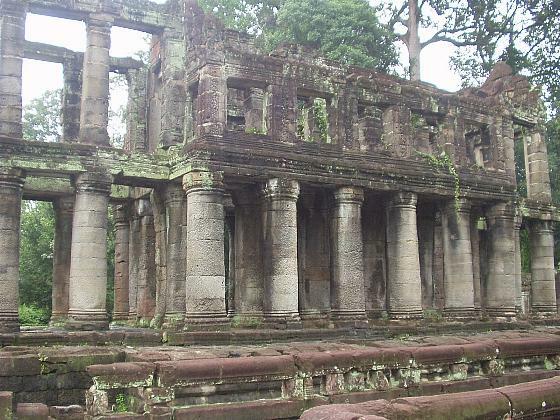 The Preah Khan temple was the center of a large Buddhist complex - also called "The City of the Sacred Sword." 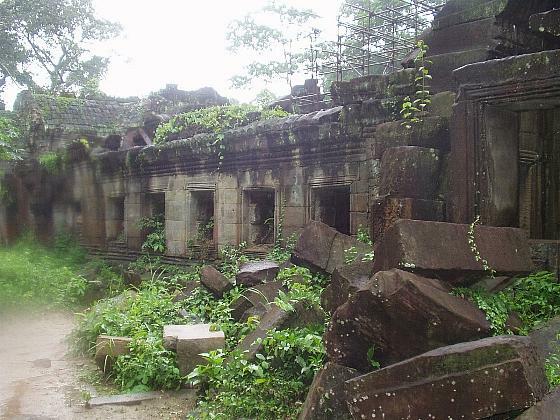 We agree with our guide book when it says this "can best be described as a partial ruin set deep in a jungle which, over the years, has taken its toll on the structures. Yet we find peaceful beauty in the interplay of nature and ancient works of art. While there is some restoration work being done here, much is currently in ruin & rubble. Now, one can only imagine the magnificent structures that once stood whole here. 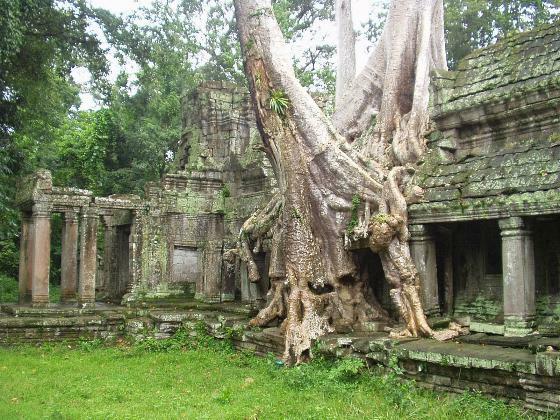 This photo shows dramatically how nature can reclaim man's work. 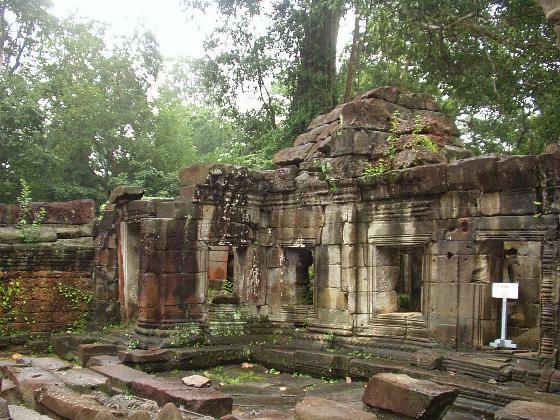 Our next stop is the Neak Pean, or the "coiled serpents," where the small central sanctuary sits atop a circular island when the man-made pond is full. Now it is empty. Sopheak & Peg rest at our next stop, East Mebon. 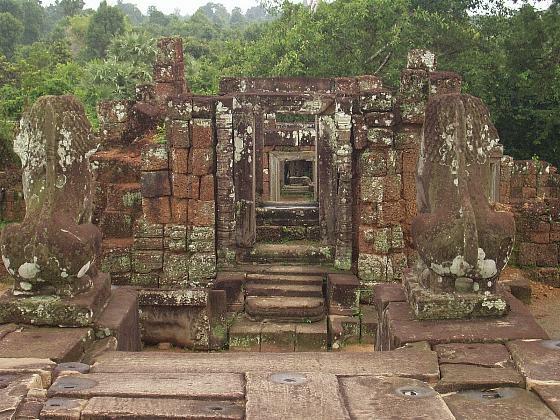 This temple dates from the middle of the 10th century. We are amazed to find the intricate stone carving on these lentils so well preserved after so many centuries. 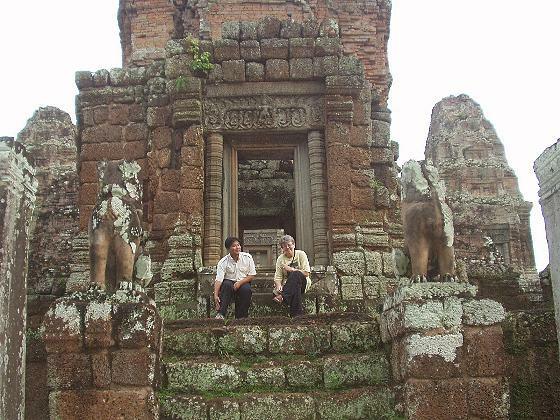 Here we look past 2 stone lions toward one of the ruined entry towers. 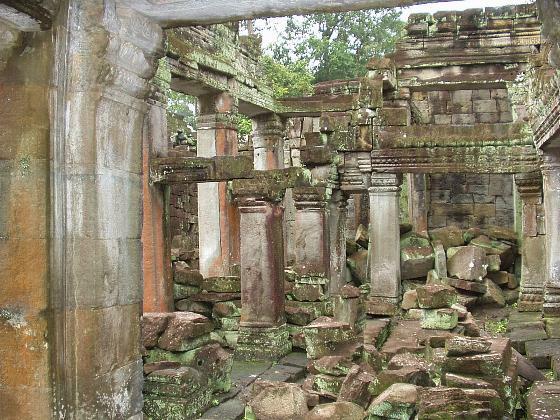 We learn that a problem with water surrounding this temple caused its abandonment. 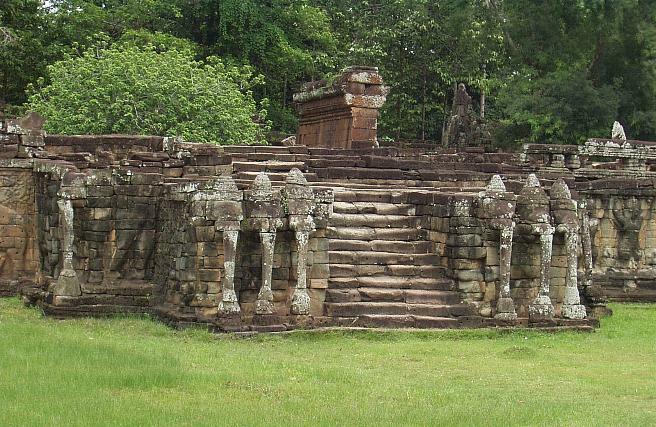 East Mebon was apparently replaced by this temple just to the south, Preah Rup. 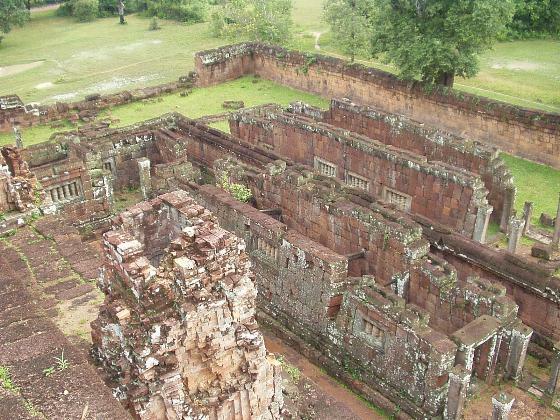 Looking down on its ruins, we can see the warm reddish tones of brick & laterite. A fitting place to end our first day of touring, here near the top of Preah Rup, we get good views of the surrounding jungle & country side - with our guide, Sopheak, & young souvenir sellers in the foreground.